Construction work has started on the renovation of the Great Waters course at the Reynolds Lake Oconee community in Georgia, USA. The Jack Nicklaus Signature Course opened in 1992 and Nicklaus Design has returned to oversee the renovation project. Chad Goetz, design associate at Nicklaus Design, said: “Jack visited the course in January of 2018 and was very clear that he was still very happy with the bones of his original design. We are not out to re-invent the course, rather we are looking to polish the design and address agronomic and technical issues that have accumulated over its 27-year life. The intent is for the course to take on its most elegant and simple form, and let the land and lake take the starring roles in the golf experience. To encourage players to ‘Tee It Forward’, Nicklaus Design is creating a new set of tees that will play at an overall length of 4,500 yards. Length is also being added to modernise the course for better players. “Using a combination of tees, players will have ultimate flexibility in selecting the course that is just right for their ability,” said Goetz. The greens will be grassed with TifEagle bermudagrass, the fairways and tees with Zeon zoysia grass, and the rough with TifTuf bermudagrass. Some trees that have encroached into the playing corridors will be removed and others will be pruned back “to restore the original turf and playing limits, reduce maintained landscape area, and improve conditions for growing quality and consistent turfgrass,” explained Goetz. 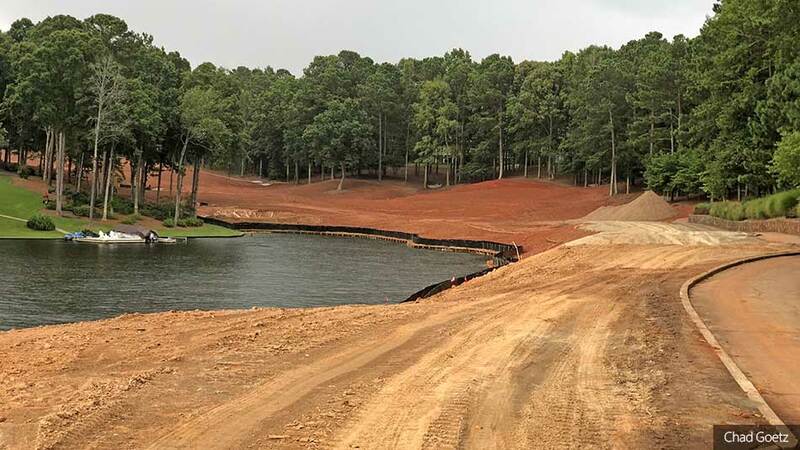 The red clay soil provides a challenge to projects in the community, and extensive erosion control measures must be employed to protect Lake Oconee. Nicklaus Design were required by the local regulations to complete the renovation in phases to control the area of open soil. The issue relating to the soil will complicate the grassing window for the turfgrass, and Goetz expects to completely sod the early holes before moving on to new areas of the site later in the project. Nicklaus Design is collaborating on the project with Reynolds Lake Oconee director of agronomy Lane Singleton and Great Waters course superintendent Brandon Hayes, and staff. Construction work is being done by Heritage Links and shaper Cliff Hamilton, who has worked on numerous Nicklaus Design courses around the world. Consultants on the project include irrigation designer Tony Altum and local engineer Rick McCallister. Construction began in July 2018 and is expected to be complete by June 2019, with the course expected to reopen in autumn 2019.